The Cape Town Philharmonic Orchestra performs Peter and the Wolf as well as Benjamin Britten's Young person's guide to the orchestra with Evita Bezuidenhout as narrator and Carlo Ponti as conductor. The Cardea Quintet performs a programme of popular chamber music as well as a brand new work by Braam du Toit especially commissioned for this concert. 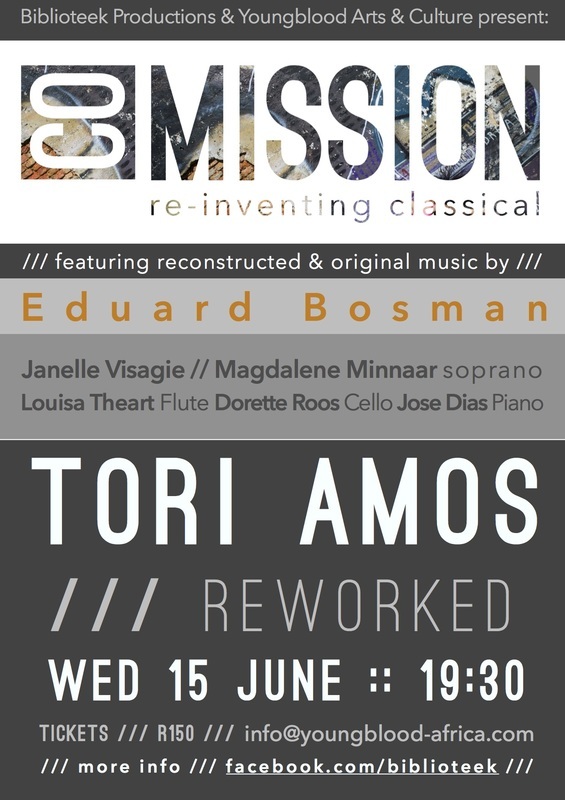 Featuring 6 new arrangements of Tori Amos songs by Eduard Bosman as well as original compositions by him. performing the Poulenc wind sonata. After a hugely successful run at the National Arts Festival 2015, the team at Biblioteek Productions return with this spellbinding operatic journey through the most famous mad scenes in the literature. The PURPUR Festival serves as a platform for the performance of experimental music. Louisa will perform PARA ~ METER for flute and live electronics with composer Miles Warrington. Featuring arrangements of famous Nirvana tracks by Matthiks van Dijk and Amy Luyendijk (Crankshaw) as well as original works by the two composers. Bring your little one for a concert called Water Music! Featuring Works by Handel and sneaky appearances by The Little Mermaid and more!! A Concert featuring famous works for orchestra beautifully arranged for Wind Quintet. Louisa will perform in the onstage band in this adaptation of The Merry Widow (Franz Lehar). Tickets available at Computicket. The Shh.. Art Ensemble will perform arrangements of Radiohead by Matthijs van Dijk, Timon Wapenaar and Galina Juritz. Original Works will also be performed. A concert of Popular Music with several soloists and conductor Brandon Phillips in celebration of women's day - featuring an all female CPO! Rondebosch Boys' High together with Rustenberg Girls' High present a Choral Concert featuring the Requiem by Rutter with full orchestra and the combined choirs of the two schools. The Gilbert and Sullivan Society are back with a run of Mikado at the Artscape Theatre. Show Times are: Tuesday - Friday 19:30, Saturdays 14:00 and 19:30 and Sundays 14:00. Book at Computicket. Louisa will play as flautist in Bibilioteek Music Production's 'Waansin' with Magdalene Minnaar. 'Waansin' is a staged collection of some of the most famous mad scenes in the operatic repertoire. More details to follow. The Third Concert in the Winter Symphony Season of the Cape Town Philharmonic Orchestra. A Concert featuring famous works for orchestra araanged for Wind Quintet for the George Music Society. A concert featuring famous works for orchestra arranged for Wind Quintet for the Mosselbay Music Society. 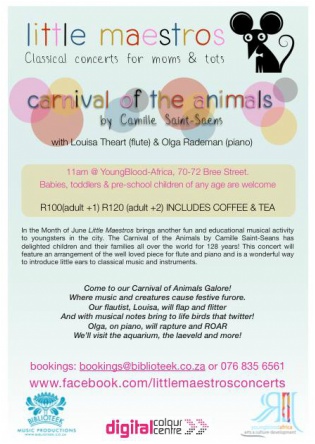 Classical Concerts for Moms/Dads and Tots at the Youngblood Art Gallery 70 Bree Street. Carnival of the Animals arranged for flute and piano! 11:00 - R100/R120/R140 - Bookings: marie@youngblood - africa.com. Email louisa@biblioteek.co.za to join our mailing list! The third concert in the Autumn Symphony Season of the Cape Town Philharmonic Orchestra. Free performances between 18:50 and 20:00 of Solo South African Repertoire by Peter Klatzow and Stefans Grove. A Co/Mission initiative. Co/Mission will take South African Art Music from the concert hall straight to the people by performing at the Open Streets Event in Langa. Performances of music by Matthijs van Dijk, Stefans Grove, Peter Klatzow, Pieter Louis van Dijk, Laura Stevens and Matthew Dennis. Performances will take place between 12:00 and 17:00 outside the Civic Hall in Washington Street. Featuring a programme of music written for combinations of Piano (Jose Dias), Flute (Louisa Theart), Cello (Dorette Roos), Clarinet (Daniel Prozesky) and Soprano (Magdalene Minnaar) by eminent and emerging South African Composers Hendrik Hofmeyr, Laura Stevens, Amy Crankshaw, Matthijs van Dijk, Adam Doden and Braam du Toit. The Fourth Concert in the Cape Town Philharmonic International Summer Music Festival presents a wonderful programme with Maria du Toit as Clarinet Soloist. Zuppe, Dvorak, Smetana, Bizet, Brahms, Mozart. The Second Concert featured in the Cape Town Philharmonic International Summer Music Festival at the City Hall. The Cape Town Philharmonic Orchestra presents the 9th International Summer Music Festival at the City Hall.